Pizza for the tailgate? Yes! It can be fun to judge local cooking contests, because I can see how much creativity is out there. The downside is discovering how many people have Cool Whip and aren’t afraid to use it, but you take your chances. Recently I was a judge for a cornmeal recipe contest sponsored by Yates Mill in Raleigh, N.C., a beautifully restored stone gristmill that still operates (and sells stone-ground cornmeal). The clear winner was a recipe that would be great for tailgating, because it combines two things sports fans love: Pizza and the grill. Brad Herring of Raleigh created a pizza with a cornmeal crust, topped with bacon, butternut squash, garlic and peppers, which he cooked in a cast-iron frying pan in his smoker. Herring said that any kind of grill with a lid would work, and that the components of the recipe could be made at home, then assembled and cooked at the tailgate. The crust had a great texture, even after it had been sitting out a while before the judging. 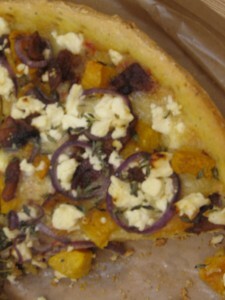 The butternut squash was a nice touch, as was the garlic cream. Find Herring’s recipe here. The Charlotte (N.C.) Observer rips the peel off the baby carrot controversy today. Like I’ve been telling y’all, those stubby “baby carrots” in plastic bags aren’t really infant root vegetables – they’re just big ones shaved down by a machine. Real baby carrots are a whole different taste sensation. Read more here. It’s in The News & Observer (Raleigh, N.C.), too. There’s a spread on mustard in the Winston-Salem (N.C.) Journal. Hey, at least I didn’t say anything about cutting it. I often make mustard as gifts, and the instructions here show how easy it is to make flavorful mustards. The culture surrounding salmon is something many diners don’t think about when eating the popular fish. The Minneapolis Star-Tribune examines the place of salmon in native cultures and makes you look at the fish differently. Read more here. And food editor Lee Svitak Dean and her staff recently received an Emmy for their Baking Central video on Irish soda bread. You can see that at the link as well. If the kids are big enough to go to school, they’re big enough to make their own after-school snacks. And the Miami Herald has recipes for treats the little darlings can prepare themselves. Whether they’ll clean up after themselves is another story. It’s all here. Atlanta Journal Constitution columnist John Kessler trumpets the uses of a little-known ingredient, Turkish pepper paste, a blend of sweet and hot delight. Read about the paste and how to use it here. Take the cans out from under your beds and sleep easy tonight: The Great Pumpkin Shortage is over. After reading this article, I have to say – gee, people, I like pumpkin bread OK, but I’m not obsessed with it. And here’s another heretical idea. I don’t serve pumpkin pie at Thanksgiving. It’s apple at my table. Don’t even bring that pumpkin-flavored beer into my house, either. Would the Pilgrims have put pumpkin in their beer, if they’d had either pumpkin or beer? I think not. As I wrote in my cookbook “Fan Fare: A Playbook of Great Recipes for Tailgating or Watching the Game at Home,” the concept of tailgating may go back as far as the late 1800s, depending on who you believe. Yale claims it was the site of the first football tailgate in 1904, when fans came in by train and brought food with them. Rutgers and Princeton say they were the first, at the schools’ first football game in 1869, when fans brought picnics in their carriages. Either way, the idea of bringing food, fans and football together is more than 100 years old, but is stronger than ever. Today, I have some tips from the next generation of tailgaters, who use the latest technology to keep the party going. A group of high school students who call themselves the Leesville Loonies Grill Team in Raleigh, N.C. organize tailgate parties before every Leesville High School football game – home or away, doesn’t matter. As many as 125 students show up for the tailgate, which is held (with permission) at a nearby swim club. The organizers use a Facebook page to provide information about the tailgate and drum up support for the team. Kyle had other advice: “Have a group of people working on [the tailgate] rather than just one or two. And always have enough burgers.” Words to live by. Do you have advice for organizing the tailgate or a great recipe? Send it on to me at debbie (AT) debbiemoose.com and I’ll share it with other fans here. Brad Herring of Raleigh, N.C., you just helped me crack 100 followers on Twitter! As promised, here is the photo of me in my deviled egg Halloween costume. No, I did not have it custom-made after “Deviled Eggs: 50 Recipes from Simple to Sassy” came out. I bought it right off the rack at Target. The object in my hand is my red devil tail. 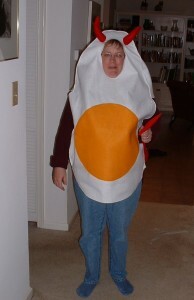 I often wear it to give out treats on Halloween. Children seem baffled. One thought I was a cow, which means we do need to educate some kids about their food. Side dishes don’t get any respect. Many people toss a salad, plop it next to a hunk of chicken and call it a meal. The Charlotte (N.C.) Observer today offers easy ways to make sides more interesting. I can vouch for the roasted green beans – put any vegetable in the oven (or on the grill) and it just seems to get better. Read more here. It’s also in The News & Observer (Raleigh, N.C.), as is an article on two people who got laid off from their jobs and decided to become farmers. Read about them here. Usually when you call out for pizza, just the pizza comes to your house. But a Winston-Salem, N.C. man will bring the entire oven to you and cook gourmet pizza on site. Read about him in the Winston-Salem Journal here. The Independent Weekly (Durham, N.C.) reviews a new book on the history of wine making in North Carolina. Believe it or not, Fayetteville, N.C. used to be a center of fine wine made by a former Confederate general. Read more about the book here. Parsley – it isn’t just a garnish anymore. It’s a real ingredient. The Oregonian (Portland, Ore.) offers recipes and tips to give the green stuff some respect. Even the much-maligned curly parsley. The article is here. The North Carolina State Fair is just a few weeks away, and there is always fierce competition in the food and cooking contests. The Dallas Morning News interviews past winners at the Texas State Fair, who provided tips for this year’s competitors. And, boy, do I want a big bite of that cake in the photo. Steal some ideas here. If canning is too daunting for you, soak fruit in alcohol to preserve it. The New York Times tells you how today. It’s all here. Ah, the thunk of the football, the smell of the grill…. Everyone is a winner at the tailgate. Sports fans are almost as superstitious as the players, and many have special food that you must have, to beseech the tailgate gods to sway the game. And it tastes good, too. Look for Tailgate Kickoff starting this Thursday, a weekly feature where I’ll share tips and recipes I learned while writing “Fan Fare: A Playbook of Great Recipes for Tailgating or Watching the Game at Home” and other experiences along the way. I hope some of y’all will offer your advice, too. It was torture not being able to take a bite or sip from the tabletops at An Alice Affair on Tuesday. The other two judges and I had to go on looks at the Durham event, which raised money for the Inter-Faith Food Shuttle. Fourteen area members of the National Association of Catering Executives competed in three categories with an Alice in Wonderland theme. The winner in the Wonderland category (no spending limit) was the Washington Duke Inn and Floral Dimensions of Durham. It’s hard to describe the design, and it was even harder to photograph. The design kind of circled around, and told different parts of the Alice story in different places. It packed a lot into the 10-foot by 10-foot space each Wonderland contestant was allowed, but didn’t go over the top into kitsch. Other categories were Down the Rabbit Hole, where participants were limited to spending no more than $150; and High Rollers, where the scenes were atop tall cocktail tables. Entrants in each category had four hours to trick out their spots. I talked with Jill Staton Bullard, executive director for the Food Shuttle. She said that financial donations are managing to hold steady, but that the amount of food the shuttle recovers from restaurants is way down. Restaurant are cutting costs, so there’s less food leftover. I opened my News & Observer (Raleigh, N.C.) Features section today to….”Survivor.” Apparently, the new season starts tonight, and I still don’t know why I should care. Where’s my Food? Oh, at the bottom of the page, next to a rock concert review. The article is by your humble blogger, offering tips to make football tailgating simple. I can’t help your team, though. It’s here. A new downtown city market is contemplated in the Charlotte (N.C.) Observer. The question is, will anyone shop there? Read more here. The joy of end-of-summer dining at walk-up windows is the topic in the Wilmington (N.C.) Star-News. Save money, too. The story is here. Another installment in the ongoing story of the opening of Husk is in the Post and Courier in Charleston, S.C. The restaurant’s chef, Sean Brock, will source everything on the menu from the South. That means no olive oil or balsamic vinegar, among other things. I hope for bacon fat as a substitute. Read more here. The San Francisco Chronicle takes readers behind the scenes at the French Laundry, the California restaurant recognized as one of the world’s best. I couldn’t help thinking of “Ratatouille.” The article is here. Exotic new flavors of soda pop and how to cook with them is the subject in the Chicago Tribune. Anyone remember Wacky Cake? Read the article, accompanied by a photo of a stunningly pink cake, here. I am one sick sistah, but I’m not alone. Halfway through the 18 hot sauces I tasted as a judge at the N.C. Hot Sauce Contest on Saturday in Oxford, N.C., I was shaking my head and grinning. So was my fellow hot-head, Ross Ragonese, head of the culinary arts program at Vance-Granville Community College. The three judges at the other end of the table simply stared at us. They had taken the barbecue sauce judging, either because they were more sensible, or just plain chicken. Those judges were barbecue expert Bob Garner, food writer Al Carson and my friend and News & Observer food writer Andrea Weigl, who confessed that she can’t take the heat. When I said my lips were going numb and grabbed lip balm from my purse, she looked at me as if she wished she’d brought a straitjacket. But, hey, I didn’t need my lips for a few hours. The trend of the bhut jolokia chile, also called the ghost chile, that started at last year’s contest, grew this year. Two sauces contained this world’s hottest chile (more fiery than habaneros) last year; about five used it this time. A couple of sauces used a chile that was new to me, the fatali. The fatali is an African pepper that is yellow or orange-yellow, and looks like an elongated jalapeno. It’s said to be hotter than habanero and has a mild lemon-peach flavor. There were some wacky sauce ideas, from one spiked with the green liquor absinthe to another aged in whisky barrels. We selected GMC Bhut Sauce of Holly Springs as the Critic’s Choice for its combination of sweet flavor and heat. Race City Sauce Works‘ 98 Octane Ghost Pepper Reserve was the selected as the hottest, containing bhut jolokias and fatalis, plus habaneros and red savinas, but it had good flavor as well. 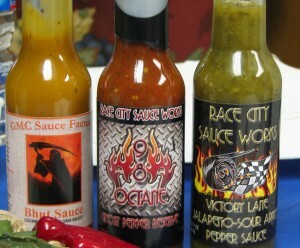 The Charlotte company also had the one judged Most Unusual, the Victory Lane Jalapeno-Sour Apple Pepper Sauce. I can’t wait to crack open my stash. Watch out, Moose Manor party attendees.